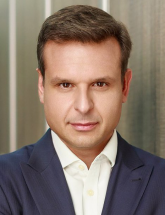 Dimitris Raptis joined Globalworth in November 2012, following 15 years of experience in the financial services and real estate investment management industries with Deutsche Bank. The last 12 years were spent as a senior member of the real estate investment management group of Deutsche Bank’s Asset and Wealth Management division (“RREEF”). From 2008 to 2012, Dimitris was Managing Director and European Head of Portfolio Management for RREEF Opportunistic Investments (“ROI”). In this role, he was responsible for overseeing ROI’s acquisitions across Europe, as well as managing ROI’s pan-European real estate investment portfolio consisting of 40 investments with a gross asset value in excess of €6bn. From 2000 to 2008, Dimitris was a senior member of the team responsible for originating, structuring and executing real estate investments, with a main focus on the French, Italian and South-Eastern European markets with an enterprise value in excess of €5.5bn across all major asset classes.